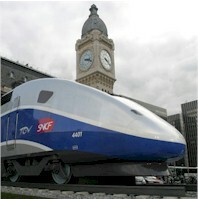 Paris train stations cab service... transfer from and to Gare du Nord, Gare de l'Est,Gare de Lyon,Gare d'Austerlitz. Eurostar, Thalys, SNCF..
Luxembourg, Zurich, Stuttgart, Frankfurt, Reims, Nancy, Strasbourg, to Paris Gare de l'Est . We make your private or business journey pleasant and easy. 9-train company name (Thalys, Eurostar...). Approximate fare, per car, in EURO,meeting you at the end of the platform with a nameboard, help you with your luggage, door to door service. Will meet you in the arrivals hall with a sign, help you with your luggage, and take care of your transfer, point to point. GPS navigator in all our cars, to join easily, any address in France. baby and child car seats could be installed if requestsed. 3 types: baby car seat, child car seat, booster. by credit card . prepayment on the phone and in the taxi.